The Canadian Journal of Dental Hygiene (CJDH), established in 1966, is the peer-reviewed research journal of the Canadian Dental Hygienists Association. 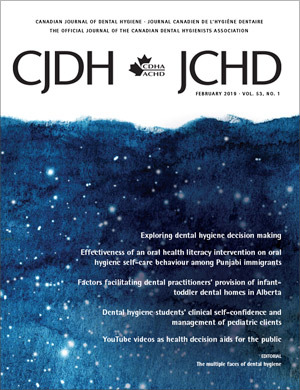 Published in February, June, and October, CJDH welcomes submissions in English and French on topics of relevance to dental hygiene practice, education, policy, and theory. For details on how to submit a manuscript to the journal, please visit our Guidelines for Authors page. CJDH is indexed in biomedical databases—CINAHL, EBSCOhost, ProQuest, Scopus, and Thomson Gale. For more information about the journal, please contact the Editorial Office by email at journal@cdha.ca or by telephone at 613-224-5515 x135 or 1-800-267-5235 x135.